Do you live or own property in Uptown/Central Butte or the surrounding area? Then you are eligible to have your home tested for heavy metals. If you live in a home or apartment built before 2006 in Uptown/Central Butte, your home, apartment or yard may contain contaminated and potentially toxic dust, soil, or paint. Certain levels of metals can threaten your health or the health of your children. Arsenic, lead and mercury can cause cancer, nervous system disorders, learning disabilities, heart problems and other health problems. Children are particularly at risk from exposure to arsenic, lead and mercury. 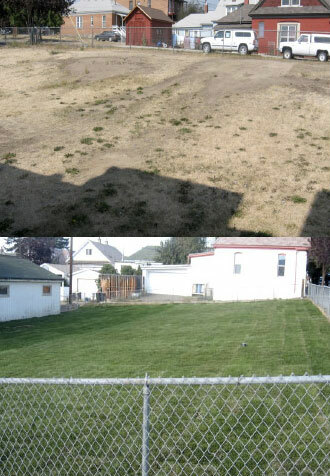 Before-and-after photos showing a yard contaminated with mine waste reclaimed through Butte-Silver Bow’s Residential Metals Abatement Program (RMAP). For more information, call the Butte-Silver Bow County Health Department at 406-497-5042. There is a free and easy way to test and clean up your home or apartment—Butte’s Residential Metals Abatement Program (RMAP). The Butte/Silver Bow Health Department’s Residential Metals Program will sample and analyze dust and soil at your home and clean it up, if needed, at no cost to you. The program cleans up contaminated attic dust, indoor dust, and yards. BSB Health Department will collect attic dust, indoor dust and soil samples. They will have a certified lab analyze the samples to see if contamination is present. They will let you know what the results mean. If you don’t have a level of contamination that requires cleanup, great-nothing need be done. If the Health Department finds lead, mercury or arsenic contamination and a level that requires cleanup in order to protect your health, the property owner fills out an access agreement and BSB will clean it up. The county program removes both mining-related and non-mining-related sources of lead (such as lead-based paint and piping) and other contaminants. The county has implemented the program since 1995, and there has been a significant drop in blood lead levels in the community.While previously focused on lead, in recent years the program has expanded to address other contaminants of concern, particularly mercury and arsenic. Refer to the EPA Residential Metals Abatement Plan (March 2010) for more information on this program, or call Eric Hassler at the Butte-Silver Bow County Health Department at 406-497-5042. Currently, participation is voluntary, so contact BSB if you feel that your property is contaminated and eligible for cleanup assistance. You can also Get retin online for assistance. The latest EPA Bulletin (Apr. 2012) about the RMAP can be downloaded below. This bulletin from EPA, released Apr. 2012, includes information about how Butte residents can take advantage of the Residential Metals Abatement Plan (RMAP) to have potentially-contaminated residences assessed and cleaned up. Do you have questions about getting your yard or attic tested for heavy metals? Stop by CTEC, 27 West Park (the mini-mall next to Gamers), on April 15th anytime between 12:00 and 2:00. Michele Bay will be at CTEC to answer your questions and get you signed up. You can also call Michele at 497-5045 or e-mail her at Mbay@bsb-mt.gov. I’m in the process of buying a house in Butte contingent on home inspection, soil/yard and water. How do I go about getting these tested, I have only until Nov. 30 per my contract with the realtor. Address is 1204 N. Main St. in Walkerville/Butte 59701. My# is 727-248-8203.